Hey Damali, What’s a Self-Help Swap? Thursday March 28, 2013 6-9 pm. Bring your used books and CDs and trade them in! Or just come get free stuff! [dropcap]A[/dropcap]mos Eno Gallery is pleased to present Self-Help Swap, an event that invites participants to swap self-help items with one another or take items at no cost. The gathering was developed and presented by damali abrams during her Fellowship at A.I.R. Gallery in 2010 and will now travel a few doors down to Amos Eno. [dropcap]S[/dropcap]elf-help can be isolating so this performance aims to bring people together into a communal healing experience. Self-Help Swap is an opportunity for the public to trade self-help items they no longer need and take new ones. 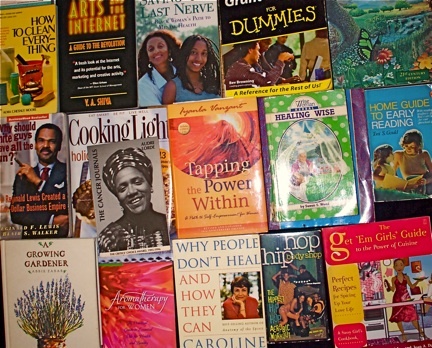 The public is invited to bring books, magazines, tapes, DVDs or CDs related to finances, health, relationships, abuse, or any form of general self-improvement material. The performance demonstrates how in these challenging economic times, we do not have to spend a lot of money for self-improvement and that engagement with others can also enhance community building. This communal interaction is based upon historical precedents such as the Black Panthers’ free breakfast programs for children and feminist consciousness-raising groups. Is Your Man Marriage Material? Who Makes a Good Husband?